Chief Minister Andrew Barr was joined by the airports managing director, Stephen Byron, to turn the first sod for Constitution Place. Constitution Place, a building adjacent to the ACT parliament, will house 1700 public servants. The Snow family's company and owner of the Canberra Airport, Capital Property Group won the tender to build the government office block. The 9000 square metre car park on the corner of London Circuit and Constitution Avenue will be redeveloped into two buildings, linked by a Melburnian-style laneway. One will be five storeys of government offices and the other will have 12 levels of commercial offices and be home to Adina Apartment Hotel Grand, a five-star hotel with 132 rooms over four levels. It will also include basement level public parking. The laneway will have cafes and shops and connect with Canberra Theatre Centre to Constitution Avenue. The chief minister was joined by the airports managing director, Stephen Byron, to turn the first sod. 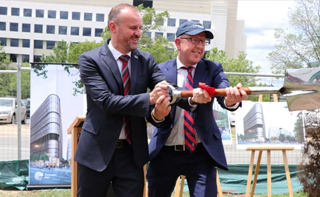 "It is our intention to contribute to the public life of Canberra, and this project will create a vibrant precinct that will be the new epicentre of work, culture, dining and socialising in our national capital," Mr Byron said. Mr Barr said the mixed use development will provide an economic boost for the Territory, creating hundreds of jobs during the construction phase. He said the basement carpark would provide more space than currently offered. The current car park will close on Saturday. "There's replacement car-parking being configured for the interim while this surface car park is lost, but ultimately at the end of the construction process, you end up with more parking, reflective in the fact there would be more activity," Mr Barr said. "Of course during the course of the construction of this project the first stage of light rail will be complete, there will be new rapid bus routes so there will be a lot more public transport provision." Construction is expected to finish in mid-2020.